As the sunset hues glisten off the water of the Bay of Fundy in Nova Scotia, Canada, the Cape d'Or Lighthouse watches over the coastal region. 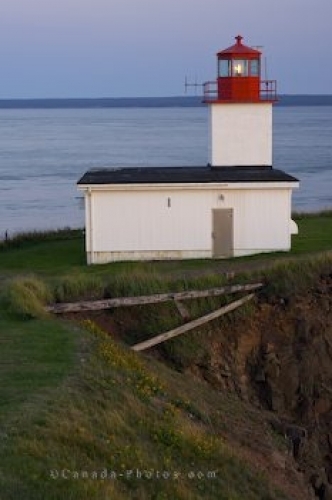 High on the coastal cliffs along the shores of the Bay of Fundy in Nova Scotia, Canada, the Cape d'Or Lighthouse watches over these treacherous waters aiding vessels safely on their travels. Once run by lighthouse keepers when it was built in 1965 and up until 1989, the Cape d'Or Lighthouse is now fully automated. The lighthouse building is now home to a kitchen which is used by gourmet chefs who create elegant meals for guests who come to dine at the restaurant. There is also overnight accommodations for those who need a great place to getaway where a sunset, the coastal scenery and the sounds of the Bay of Fundy crashing across the rugged cliffs is all that surrounds you. Throughout Nova Scotia, the Cape d'Or Lighthouse is the only one which offers guests overnight accommodations with the added bonus of amazing coastal scenery. Picture of a coastal sunset over the Cape d'Or Lighthouse in the Bay of Fundy, Nova Scotia.